Montreal Poster by Steve Thomas – Coming Soon! I actually dont remember precisely where or when I first saw Steve’s work, but it caught my eye immediately: filled with allusions to vintage posters and product art from the early 20th century, and inspired by his love for advertising, art and travel, his posters literally offer to take you to places you have never been before (and are not likely to get to any time soon). Kind of retro-futuristic, the subject matter, the colors and even the typography remind us of some the great Art Deco posters of the 1920s and 30’s. Steve has done work for Star Wars, Disney, Fox, Star Trek, the Muppets, and … us! 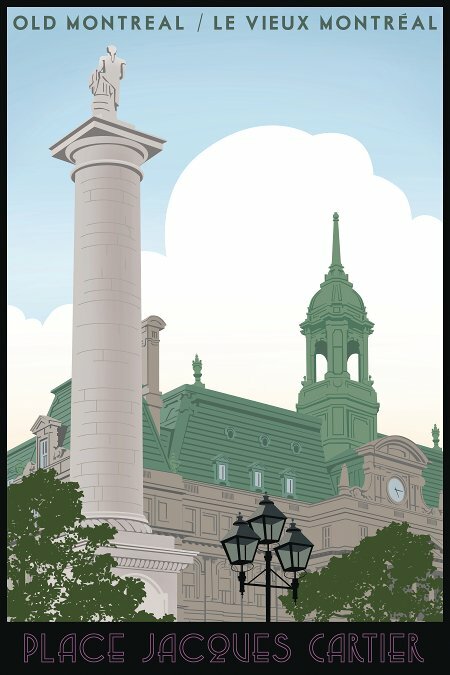 We are proud to share with you the first peek at our Steve-Thomas commissioned poster… we are in the process of printing it up and as soon as it’s available, we’ll let you know! The boardroom of my mind – since I work in a home office. The Minnesota State Fair, the Mall of America and a National Park. Content, but unfulfilled. I have many ideas that I need to put into some artwork. Trompe l’oeil. At least then it could seem that you have windows, or shelves with things on them, etc. Give some away, invest some and spend the rest. I’d like to be a little taller. Not much, about an inch or so. Getting married and having three beautiful children. Friends and family and a place to sit and laugh together.